UA’s General Education Taskforce invites interested faculty, staff, and students to join them for one of two public forums during which the Taskforce seeks input on the impact of the current core curriculum and thoughts on general education requirements that will provide experiences connecting the learning goals of the major with the work of Student Life, and a curriculum that further supports the development of curious learners, critical and creative thinkers, and informed and engaged citizens. The first forum is Tuesday, March 19, from 3 to 4 p.m. in the Heritage Room, Ferguson Center. The second forum is Friday, March 29, from 3 to 4 p.m. in 205 Gorgas Library. The University of Alabama General Education Taskforce (GET) is charged to lead a campus-wide review of The University of Alabama’s general education requirements and experiences and to develop a comprehensive plan for general education that connects the learning goals of the major, the work of Student Life, and a curriculum that further supports the development of curious learners, critical and creative thinkers, and informed and engaged citizens. The development of a well-educated undergraduate involves more than a collection of courses that lead to a degree. Students should engage in courses and experiences that are dynamic and integrative. To that end, the General Education Taskforce is charged with detecting the UA community’s expectations of general education and the current general education experiences at UA, comparing them with research-based practices that support student learning and success, and identifying the processes needed to develop, approve, implement, assess, and periodically review a responsive, dynamic program of general education. What does the UA community expect all graduates to have gained from their undergraduate experiences at UA? What are the fundamental skills, abilities, and behaviors that every UA student should develop as a result of completing the general education requirements? What are the purposes of a general education program? What is the process for revision, ratification, implementation, ongoing review, administration, and assessment of a comprehensive plan for general education? 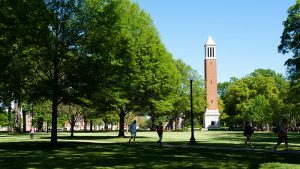 The members of the General Education Taskforce have been selected to lead a campus-wide review of The University of Alabama’s general education experiences and to develop a comprehensive plan for general education. We would like to get your feedback. Please send us your comments using the form below.